Description: Apply access-list 1 to interface Ethernet 0 on R1. 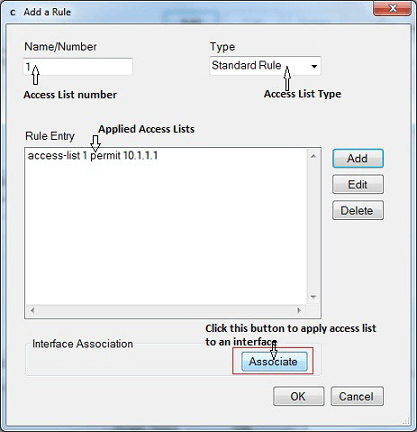 Apply the access-list on both incoming and outgoing interfaces. 1. Select device R1 from Select Device drop down list , click Configure > Router > ACL > ACL Editor > click Add button in Additional Tasks window. 3. Select Standard Rule from Type drop down box and click Add button. 4. 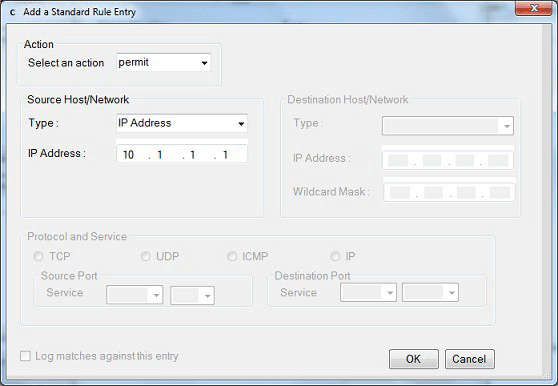 In Add a Standard Rule Entry screen select “permit” from Select an action drop down box and in Source Host/Network select “IP address” from Type drop down box and enter the ip address 10.1.1.1 in the IP address field and click OK button. 5. Click Associate button in Add a Rule screen. 8. 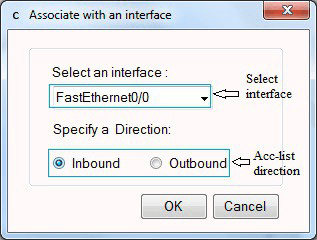 In associate with an interface select an interface Fastethernet0/0 and specify the direction “outbound” and click OK button. Follow step 6. 9. Also click OK button in Add a Rule window and then click close button in Additional Tasks window.